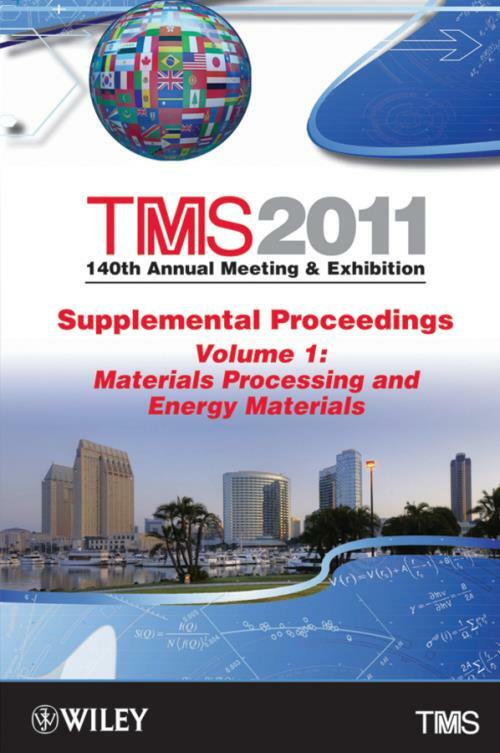 Supplemental TMS 2011 Proceedings collect some of the most important papers presented at the meeting, giving readers the opportunity to benefit from the latest discoveries in mineral, metals, and materials research. Topics cover everything from minerals processing and primary metals production to basic research and advanced materials applications. Moreover, you′ll learn about the latest research efforts within the industry to develop sustainable, environmentally friendly products and processes. Supplemental Proceedings: Volume I: Materials Processing and Energy Materials. Advances in Science–Based Processing of Superalloys for Cost and Sustainment. Processing Advancements via Modeling and Simulation. Numerical Simulation of Directional Solidification of Turbine Blade by LMC Process (N. Tang, Q. Xu, and B. Liu). Residual Stress and NDE Technologies for Components. Nondestructive Evaluation of Microstructure in Super Alloy Disk Material (J. Blackshire, E. Medina, andJ. Na). Role of Recycling in the Life Cycle of Batteries (J. Sullivan, L. Gaines, and A. Bumham). A Preliminary Investigation for Spent LIBs Recycling (M Chen, F. Zhang, andJ. Zhu). Challenges in Mechanical Performances of Materials in Next Generation Nuclear Power Plants. Nitride–strengthened Reduced Activation Martensitic Steels (Y. Shan, P. Hu, W. Y an, W. Wang, W. Sha, and K. Yang). Inclusion Initiated Cleavage Fracture in a Nitride–Strengthened Reduced Activation Martensitic Steel (W. Y an, W. Wang, P. Hu, L. Deng, Y. Shan, and K. Yang). Characterization of Nuclear Reactor Materials and Components with Neutron and Synchrotron Radiation. Irradiated Materials and Technique Development. Characterization of Radioactive Materials using the MARS Beamline at the Synchrotron SOLEIL (B. Sitaud, P. Solari, S. Schlutig, and H. Hermange). Process–Property–Performance Correlations – 1; Metallic Coatings. Improving High Temperature Performance of Aluminum Foams by Nickel Coating (Z Cao, H. Liu, Y. Liu, andG. Yao). Studies on Ni–Ti Thin Films Deposited by Bias Assisted Magnetron Sputtering (B. Priyadarshini, S. A ich, and M. Chakraborty). Process–Propertv–Performance Correlatio.ns – II; Metallic, Semiconducting and Insulating Coatings. The Development of a Non–Destructive Multiple Partial Unloading Micro–Indentation Technique for Thermal Barrier Coating Spallation Prediction )J. Tannenbaum, K. Lee, B. Kang, and M. Alvin). Effect of the Duty Cycle on the Microstructural, Mechanical and Tribological Properties of TiN Layers Deposited by PACVD (M. Mahdipoor, M. Montazeri, M. Soltanie, F. Mahboubi, M. Habibi, andS. Ahangarani). The Influence of Pre–treatment Plasma Nitriding on Tribological Properties of TiN Coatings Produced by PACVD (M. Mahdipoor, F. Mahboubi, M. Raoufi, H. Elmkhah, andM. Habibi). The Effects of Annealing and Si Content on the Charge–discharge Characteristics of Al–Si Thin Film with Pre–deposited Al Layer (C. Wu, F. Hung, T. Lui, and L. Chen). Metallic, Semiconducting, Insulating Coatings – Applications. Effect of Gas Ambient on the Synthesis of Al and N Co–doped ZnO: (A1,N) Films and their Influence on PEC Response for Photoelectrochemical Water Splitting Application (S. Shet, L. Chen, H. Tang, T. Deutsch, H Wang, N. Ravindra, Y. Y an, J. Turner, andM. Al–Jassim). NanoStructured Zinc Oxide Coatings Developed via Solution Precursor Plasma Spray Technique (R. Tummala, R. Guduru, and P. Mohanty). Spin Coated Er2O3–SiO2 Films on Silicon Substrates(S. Abedrabbo, B. Lahlouh, A. Fiory, and N. Ravindra). Magnetic Material Interactions for the Method of Magnetic Field Directed Assembly (R. Rivero, M. Booty, A. Fiory, andN. Ravindra). Flame Spray Deposition of Composite Titanium Alloy and Bioactive Glass Coatings (G. Nelson, A. McDonald, andJ. Nychka). Influence of Substrate Temperature on the Photoelectrochemical Responses of GaandN Co–doped ZnO Films (S. Shet, H. Wang, N. Rovinar a, Y. Y an, J. Turner, and M. Al–Jassim). Preparation of TiFe Alloy by Electrolysis in Molten Salt (H. Meilong, B. Chenguang, S. Ruimeng, L. Xuewei, and L. Xuyang). Recapturing Metals from Electrocoagulation Floe (J. Gomes, M. Islam, P. Bernazzani, G. Irwin, D. Rutman, D. Coche, and M. Islam). Mechanism of Antimony Deposition in Alkaline Solution Containing Xylitol (W. Liu, T. Yang, andQ. Zhou). Preparation of Ti–Al Intermetallic by Electrolytic Reduction from TiO2 and Al2O3(C. Yang, D. Jihong, and Z. Xi). Hydrogen Storage in Materials: Theory and Experiment. Mg–based Nanocomposites for Room Temperature Hydrogen Storage (M. Jurczyk, M. Nowak, L. Smardz, and A. Szajek). Production and Characterization of Supported Transition Metal Nanoparticles on Multi–Walled Carbon Nanotubes Functionalized by Gamma Irradiation and Chemical Process (J. Rojas, andC. Castano). Enhanced Pressure Dissolution of Enargite Using Pyrite or Ferrous Sulfate (M. Ruiz, O. Jerez, J. Rétamai, and R. Padilla). Model and Simulation of Ion Exchange of Antimony (G. Cifuentes, J. Simpson, C. Zuniga, L. Briones, and A. Morales). Analysis of the Adsorption of Gold and Silver on Magnetic Species Formed in the Electrocoagulation Process (J. Parga, J. Valenzuela, and V. Vazquez). Treatment of Acid Mine Drainage by Electrodialysis (D. Buzzi, L. Viegas, F. Silvas, M. Rodrigues, I. Schneider, A. Bernardes, D. Espinosa, andJ. Tenario). Investigations on the Mechanism of Acid Leaching of Alkali–activated Ilmenite Concentrate and Titanium–rich Slag (Q. Xu, Y. Fu, J. Jin, J. Du, and L. Sun). Kinetics Study of Alkaline Decomposition of Rubidium Jarosite in Ca(OH)2 Media(E. Cerecedo, E. Salinas, L. Longoria, F. Carrillo, andJ. Hernandez). Leaching of Gold in Acid Thiourea–thiocyanate Solutions using Ferric Sulfate as Oxidant (X. Yang, X. Shi, H. Xu, M. Moats, J. Miller, X, Xiao, andL. Ma). Modeling of Cobalt and Nickel Extraction by Solvent Extraction in Sulfate Media with D2EHPA in Isoparaffin (17/21) (C. Sousa Junior, M. Nascimento, I. Masson, and O. Cunha). Magnetocaloric Study of Mechanically Alloyed LaFeSi (M. Phejar, L. Bessais, and V. Paul–Boncour). Room Temperature Magneto–caloric Effect in Fe Substituted Ni–Mn–Sn Alloy (R. Das, A. Perumal, and A. Srinivasan). Influence of Heat Treatment on the Structure and Magnetic Properties of Gd5Sn4 Alloy for Magnetic Refrigeration (X. Zhong, H. Zhang, M. Zou, Z. Liu, D. Zeng, K. Gschneidner, and V. Pecharsky). Recent Advances in Non–oriented Electrical Steel for EV/HEV Traction Motor (I. Tanaka, and H. Yashiki). Effect of Different Annealing Methods on Structure and Texture of Primary Recrystallization of Grain–oriented Silicon Steel (L. Li, L. Liu, X. Wu, W. Shi, and Q. Zhai). Fabrication of High Performance Fe–Si–Al Soft Magnetic Composites (J. You, Q. Li, andK. Qiu). Development of High Coercivity Nd–Fe–B Permanent Magnets (M. Komuro, Y. Satsu, H. Suzuki, A. Nambu, K. Veda, A. Sugawara, andH. Matsuoka). Effects of Cu Addition on Microstructures and Magnetic Properties of Nd–Fe(Co,Cu)–B Nanocomposite Magnets (J. You, K. Qiu, Y. Ren, and F. Lian). Hard Magnetic PrCo3 Structural and Magnetic Properties (L. Bessais, K. Younsi, V. Russier, andJ. Crivello). Magnetic Hardening of Nanocrystalline Sm–Fe–Mo Synthesized by Mechanical Alloying (L. Bessais, S. Khazzan, N. Mliki, and G. Van Tendeloo). Requirements of Magnetic Materials for Current Technological Applications. Industrial Requirements and Applications of Hard Magnetic Materials (J. Liu). Magnetostrictive Behavior of Fe–W Alloy Single Crystals (G Garside, C. Ren, B. Saha, M. Ramanathan, andS. Guruswamy). Investigation of D03 and B2 Type Ordering in Quenched Magnetostrictive Fe–27.5 at.%Ga Alloy Single Crystals (C. Ren, G. Garside, B. Saha, M. Ramanathan, andS. Guruswamy). Influence of Plastic Deformation on the Magnetostrictive Behavior of –oriented Fe–Ga Alloy Single Crystals (B. Saha, G. Garside, M. Ramanathan, C. Ren, and S. Guruswamy). Materials in Clean Power Systems VI: Clean Coal–, Hydrogen Based–Technologies, and Fuel Cells. Materials for Gasification and Tubines II. An Investigation on Hot Corrosion Resistance of Plasma Sprayed YSZ–Ceria TBC in Na2S04+V205 at 1050°C (M Saremi, and M. Habibi). Development of A New Alloy for SOFC Interconnects (N. Yasuda, T. Uehara, S. Tanaka, andK. Yamamura). Electrodeposited Metal Ni Coating on Ferritic Stainless Steel for Intermediate Temperature SOFC Interconnect Application (S. G eng, and F. Wang). Investigationof 5 Mol% YSZ Electrolyte for SOFC (N. Duygulu, and A. Ekerim). Membranes and Materials for Renewable Energies. Electrodeposition of ZnO Nanocrystallines on ITO Mesoporous Films and Application to Photoelectrochemical Cells (H. Chen, L. Zhu, W. Li, and H. Liu). Optimization of the Concentrated V(IV)/V(V) Electrolytes in a Vanadium Redox Battery (F. Shi, H. Lu, Y. Yuan, and Z. Jingha). Processing and Properties of Powder–Based Materials. Process Simulation of Cold Pressing and Sintering of Armstrong CP–Ti Powders (S. Gorti, A. Sabau, W. Peter, S. Nunn, Y. Yamamoto, and W. Chen). Effect of Particle Size Particle Surface Modification Pressing Pressure and Sintering Temperature on Microstructure and Mechanical Properties P/M Al–B4C Composites (F. Toptan, I. Kerti, S. Daglilar, A. Sagin, and T. Hacioglu). Effect of HCl Concentration on ZrB2 Separation from a Self–propagating Hightemperature Synthesis (SHS) Product (B. Akkas, M. Alkan, B. Der in, and O. Yucel). Characteristics of TiN/Fe Cermet Fabricated by Mechanical Milling and Pulse Current Sintering (H. Nakayama, K. Kobayashi, andK. Kikuchi). Comparative Study of Production of Boron Carbide Powder by: Resistance Furnace and Arc Furnace (H. Amini Rastabi, and A. Karimi Dehcheshmeh). Prediction and Control of Nucleation Kinetics of Mono–Sized Spherical Copper Droplets (M. I slier, and T. Ando). Microstructural Investigation of D2 Tool Steel during Rapid Solidification using Impulse Atomization (P. Delshad Khatibi, A. Ilbagi, andH. Henein). Synthesis of Silver Plating Nano–copper Bimetallic Powders (W. Liu, and Q. Zhou). Effect of Heat Diffusion in Interparticle Micro–Welding for 3–D Particle Assembly (K. Takagi, K. Ozaki, andK. Kobayashi). Characterization of Al–Ni Composites Produced by Ultrasonic Powder Consolidation (D. Erdeniz, and T. Ando). Comparison of the Effect of Particle Size on the Compressive Strength of Sintered Wollastonite – and Chemically Bonded Phosphate–Ceramics (H. Colorado, J. Juanri, C. Hiel, H. Hahn, andJ. Yang). Laser Cladding of Functional Coatings for Biomedicai Applications (S. Wang, andL.Xue). Mechanical Alloying/Milling, Reactions and Consolidation. Investigation of Mechanical Alloying Process Parameters on Fe–Mn–Si Based System (A. Söyler, B. Özkal, and L. Bujoreanu). Investigation of Solid State Reaction Mechanism for Sodium Metaborate (NaBO2) Production(A. Kantiirk Figen, H. Ergüven, andS. Piskin). Properties, Processing, and Performance of Steels and Ni–Based Alloys for Advanced Steam Conditions. Mechanical Behavior and Physical Metallurgy. A Study on Constitutive Model for Alloy IC10 (H. Zhang, W. Wen, and H. Cui). High–Temperature Oxidation Behaviour of Co–Re–Cr–based Alloys (B. Gorr, S. Burk, and H. Christ). Characterization of Osmium–Ruthenium Thin Films for Cathode Coatings (P. Swartzentruber, T. Balk, andS. Roberts). WC(100) Surface and Co/WC(100) Interface: Spin–Polarized AB Initio Study (V. Zavodinsk). Oxidation Performance of Mo–Si–B Alloys: Implications through Alloying and Pre–Treatment (S. Burk, B. Gorr, and H. Christ). Microwave Sintering of Nb/Nb5Si3 Composite Material (Y. Liu, H. Lu, andJ. Dai). Silicon Production, Purification and Recycling for Photovoltaic Cells. Polysilicon in Photovoltaics: Market Conditions & Competing PV Technologies (D. Lynch, B. Codiavo, M. Marquez, A. Amooali, A. Shroads, S. De Vaile, R. Manygoats, and C Munich). Preparation of Polysilicon by the Reaction of Zinc and Silicon Tetra–chloride (T. Zhang, H. Lu, andJ. Xu). Macrosegregation of Impurities during Solidification of Metallurgical Grade Silicon in a Vertical Bridgman Furnace (M. Martorano, J. Ferreira Neto, T, Oliveira, and T. Tsubaki). Removal of Inclusions from Solar Grade Silicon Using Electromagnetic Field (A. Dong, L. Damoah, and L. Zhang). Effect of Solidification Conditions on Si Growth from Si–Cu Melts (Y. Ohshima, T. Yoshikawa, and K. Morita). Review of Developments in Production of Silicon for Photovoltaics (D. Lynch, W. Ben, X. Ji, F. Jiang, A. Salce, E. Morey, and Y. Jiao). Preparation of High Purity Silicon by Electrolysis–Vacuum Distillation (J. Li, M. Zhang, Z. Zhang, and Y. Wang). The Rate of Boron Elimination from Molten Silicon by Slag and Cl2 gas Treatment(H. Nishimoto, and K. Morita). Silicon Surface Texturing by Electro–Deoxidation of a Thin Silica Layer in Molten Salt (E. Juzeliunas, A. Cox, and D. Fray). Solid Oxide Membrane Process for Solar Grade Silicon Production Directly from Silicon Dioxide (A. Roan, S. Pati, S. Basu, and U. Pal). Silicon Electrodeposition Process in Molten Fluorides (A. Bieber, L. Massot, L. Cassayre, P. Chamelot, M. Gibilaro, and P. Taxil). Ultrasonic Welding for Lightweight Components. Mechanisms of Joint Formation in Ultrasonic Spot Welding Aluminium Automotive Sheet (P. Prangnell, D. Bakavos, and Y. Chen). Ultrasonic Welding of Hybrid Aluminum/CFRP–Joints: Microstructure, Monotonie Properties and Fatigue Behavior (S. Huxhold, F. Balle, G. Wagner, andD. Eifler).